Bats and their prey are in a constant arms race. Whereas the winged mammals home in on insects with frighteningly accurate sonar, some of their prey—such as the tiger moth—fight back with sonar clicks and even jamming signals. Now, in a series of bat-moth skirmishes (above), scientists have shown how other moths create an “acoustic illusion,” with long wing-tails that fool bats into striking the wrong place. The finding helps explain why some moths have such showy tails, and it may also provide inspiration for drones of the future. Moth tails vary from species to species: Some have big lobes at the bottom of the hindwing instead of a distinctive tail; others have just a short protrusion. Still others have long tails that are thin strands with twisted cuplike ends. In 2015, sensory ecologist Jesse Barber of Boise State University in Idaho and colleagues discovered that some silk moths use their tails to confuse bat predators. Now, graduate student Juliette Rubin has shown just what makes the tails such effective deterrents. Working with three species of silk moths—luna, African moon, and polyphemus—Rubin shortened or cut off some of their hindwings and glued longer or differently shaped tails to others. She then tied the moths to a string hanging from the top of a large cage and released a big brown bat (Eptesicus fuscus) inside. She used high-speed cameras and microphones to record the ensuing fight. Moths with no tails (such as polyphemus) were easy quarry for the bats, escaping only about 27% of the time, Rubin, Barber, and colleagues report today in Science Advances . But when Rubin enlarged the polyphemus hindwing lobe, twice as many escaped the bat’s sonar, or echolocation system. Bats going after long-tailed African moon moths got a mouthful of tail 75% of the time as the moths flitted away. Shorten the tail, and the African moon moths escaped only 45% of the time. With no tail at all, that percentage dropped to 34%. When Rubin’s colleagues Chris Hamilton and Akito Kawahara at the Florida Museum of Natural History in Gainesville built a family tree of silk moths and their relatives, they realized that long tails had evolved independently several times. That’s further evidence that they are an important life-saving feature for these moths. The findings could benefit other fields such as robotics, says Martin How, a sensory ecologist at the University of Bristol in the United Kingdom. Because the study examined the bat-moth dogfights at such a fine scale, the results could help engineers design the “bio-inspired technologies of the future,” he says, including deftly flying drones. *Correction, 5 July, 1:45 p.m.: This article has been updated to reflect that although Juliette Rubin was the lead author of the paper, some of the work was done by other researchers. – Intercropping maize with drought-resistant greenleaf desmodium and planting Brachiaria grass on the farm’s edge helps curb fall armyworms. Researchers have found intercropping maize with drought-resistant greenleaf desmodium and planting Brachiaria grass on the farm’s edge helps curb fall armyworms. Desmodium and Brachiaria grass are high quality animal fodder plants. The leguminous greenleaf desmodium becomes repellent, emitting a blend of compounds that help push armyworms away from maize while Brachiaria Mulato II grass around field edge produces chemicals attractive to the pests. The International Centre of Insect Physiology and Ecology (Icipe) said that the “push-pull” crop system also promotes soil fertility and hinders the striga weed from attaching roots of cereal crops. Icipe together with Rothamsted Research of Britain studied 250 maize farms that have adopted the push-pull method in western Kenya, eastern Uganda and northern Tanzania and found that the climate-adapted push-pull technology controls fall armyworm in smallholder farming systems in East Africa. The method was initially developed for control of cereal stem borers and striga weed. The scientists studied Kenya’s Bungoma, Busia, Siaya, Vihiga, Migori and Homa Bay sub Counties, Tarime district in Tanzania, Uganda’s Iganga, Bugiri ,Tororo and Bukedea districts. Data on number of fall armyworm larvae on maize, percentage of maize plants damaged by larvae and grain yields was collected. Each farmer had a set of two plots, a climate-adapted push–pull and a maize monocrop. There was 82.7 per cent reduction in number of fall armyworm larvae per plant and 86.7 per cent drop in plant damage per plot with push-pull systems. Grain yields were significantly higher, 2.7 times in systems plots. “The farmers in the push-pull project reported that their fields were free of fall armyworm infestation while neighbouring monocrop plots were being ravaged by the pest,” said ICIPE’s Pull-Push Leader Prof Zeyaur Khan. Newswise — Led by Professor Declan Bates from the Warwick Integrative Synthetic Biology Centre (WISB) and Professor Katherine Denby from the University of York, who is also an Associate member of WISB, researchers have developed a genetic control system that would enable plants to strengthen their defence response against deadly pathogens – so they could remain healthy and productive. When pathogens attack crop plants, they obtain energy and nutrients from the plant but also target the plant’s immune response, weakening defence, and making the plants more vulnerable. Building on experimental data generated by Prof. Denby, Professor Bates’ group simulated a pathogen attack in Arabidopsis plants, and modelled a way to rewire the plants’ gene network, creating a defensive feedback control system to combat disease – which works in much the same way as an aircraft autopilot. Just as an aircraft’s autopilot control system detects disturbances like wind gusts or turbulence and acts to reject them, this new plant control system detects a pathogen attack, and prevents the pathogen weakening the plants’ defence response. The research, ‘A Framework for Engineering Stress Resilient Plants Using Genetic Feedback Control and Regulatory Network Rewiring’, is published in ACS Synthetic Biology, a journal of the American Chemical Society. It is authored by Declan G. Bates, Mathias Foo, Iulia Gherman, Peijun Zhang, and Katherine J. Denby. Rabat- The biological pest control group, Biobest, announced the launch of its new, EUR 1.2 million “state-of-the-art” facility, which will boost Morocco’s aphid biocontrol capacity, on April 24. Aiming to satisfy the strong demand for zero-residue products and tackle the rising problem of pesticide resistance, the Belgium-based company fully equipped the 2,000 square-meter vertical livestock facility with air-conditioned rooms, thus preparing to ensure a “flexible” and “reliable” supply to its customers. “Aphids remain one of the most challenging pests to control with biological methods,” declared Biobest, which offers producers around the world a full range of “natural enemies” for agricultural pest problems, as well as the necessary technical advice for a successful pests control. While synthetic chemical pesticides are effective in protecting crops, they have proven to cause acute and chronic health effects, in addition to upsetting the natural equilibrium of agricultural systems and the environment. Biobest provides an alternative solution that uses microbial biopesticides to work against certain pests without harming other organisms. This project is expected to reinforce the company’s position as a leading supplier for integrated pest management solutions in Morocco and to underline the Moroccan franchise’s role within the global production network, asserted the managing director of Biobest Morocco, Karim Jerate. Founded in 1987, Biobest offers biofriendly solutions to producers in more than 60 countries, Through its subsidiaries, the company has productions sites, sales personnel, and technical support strategically located around the world for efficient global service. “With several production sites around the globe, our goal is to offer a flexible response capability to producers in different parts of the world. Our Moroccan team has done a remarkable job completing the construction of this new production plant on time and according to the required specifications,” said Biobest Chief Operating Officer, Karel Blockmans. Cultivated tomatoes are more vulnerable to pests and diseases, since they have lost their natural resistance in the reproduction process. Researchers are working to reverse this by reintroducing the resistance of the wild varieties through breeding, but they still haven’t been able to successfully cross breed the wild tomatoes with the cultivated tomatoes to obtain the necessary traits. The wild tomato of the Galapagos Islands, however, is genetically very similar to the cultivated tomato, and its resistance is encoded within a single chromosome, which should make crossing between the existing plants much easier. “If we can make the cultivated tomatoes resistant to whiteflies, this will directly benefit the environment,” Vosman said. 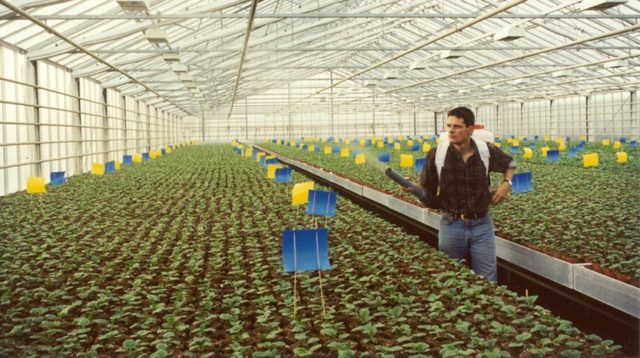 While this problem is still relatively manageable in greenhouses, through integrated control, for example, there are also pests there. In the field crops, the problems with insects are much greater. “We hope that most of the advantages are in the field crops and in the tropics,” he added.